Goji berries are small fruits that originate from Asia and are eminently valued in the traditional medicine in China. They are healthy and delicious. Goji berries fight against premature skin aging, cellulite and a lot of serious diseases. Goji berries (Wolfberry) is the fruit of Lycium barbarum and Lycium chinense – Asian plants of the family Solanaceae. Name “goji” comes from the Chinese (gǒuqǐ) and is very highly valued in the traditional Chinese medicine since ancient times. It grows in the foothills of the Himalayas. Not coincidentally, a legend exists in China that the Himalayan centenarians regularly eat goji berries. Goji berries are rich with vitamins B1, B2, B6, A, E, and C (it contains higher level of vitamin C than any other fruit), from minerals it is rich with: phosphorus, zinc, calcium, iron, copper, potassium, magnesium, sodium and selenium, 8 essential amino acids including omega-3 and omega-6 unsaturated fatty acids. Among the phytochemicals, contained in goji berries, beta-carotene and zeaxanthin are especially important. Zeaxanthin is a carotenoid, which is of central importance as a pigment in the retina. Nutritional value per 100g of goji berries: 360 kcal, 68% carbohydrate, 12% protein, 10% fat and 10% fiber. Prevents Cancer – Cancer prevention is one of the best and most important of the goji berry benefits that it offers to the consumer. Actually, these brightly colored berries are enriched with potent antioxidants which eliminate cancer-causing free radicals from the blood, thus keeping different types of cancer at bay. Controls Diabetes – Diabetes has emerged as one the major diseases in the world in modern times. Controlling or preventing diabetes is absolutely necessary, as it can lead to the development of several other diseases such as obesity, heart disease, cardiovascular disease, stroke, and ocular diseases. One of the major health benefits of consuming goji berries is that it can help in controlling diabetes. Recent studies suggest that the fruit extracts of goji berries possess considerable hypoglycaemic properties. Studies also indicate that using goji berries to control diabetes will yield no negative side effects. Boosts Immunity – Goji berry juice contains lyceum labarum polysaccharides, which help to strengthen the immune system. Goji berry juice also increases white blood cell activity in the body, reducing the severity of flu symptoms. Pregnant women can consume Goji berry juice to alleviate morning sickness. Antifungal Properties – Goji berry juice contains a powerful antibacterial compound called solavetivone. This powerful compound is known to reduce antibodies associated with allergic reactions. It also contains beta-sitosterol, a powerful anti-inflammatory agent, which prevents gout and other inflammatory diseases. Improves the Vision – Goji berry, due to its antioxidant properties, also helps in improving eyesight. The antioxidants protect the eye from free radicals that may cause loss of eyesight, cataracts, and other eye-related disorders. Aids in Weight loss – Goji berries pack healthy food energy into small servings. Their rich, sweet taste, along with their high fiber content, can help you stay on track with eating healthy. Turn to them for a light snack to prevent overindulgence at mealtime. Add them in your yogurt or salad in the same way you would use raisins. Goji berry strengthens the immune system. Lycium reduces the risk of cancer. 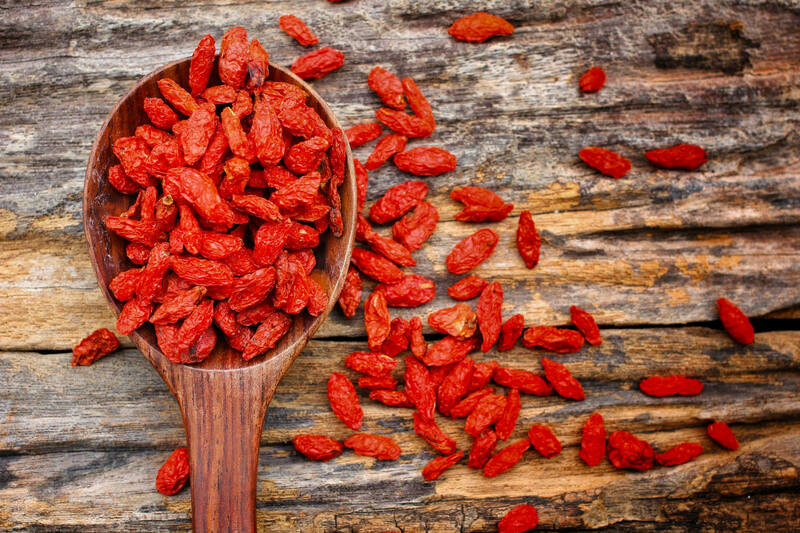 Goji berries are normalizing the functions of the liver and the digestive tract. Helps with diabetes, asthma, hypertension, and various allergies. It is used for detoxification of the body. It has beneficial effects for symptoms such as fatigue, weakness, insomnia, headache, tinnitus, erectile dysfunction, etc. Goji berry is very effective in the fight against cellulite. Goji berries can be consumed dried or after soaking in warm water for about 10 minutes, preferably 20-30 grams a day, before meals. Can be prepared as tea, 2 tablespoons of dried goji berries are boiled in half a liter of water for about 5 minutes, and the tea is ready.